Honey is the sweet result of the bees magically transforming the nectar they gather from flowers. Honey is about 80 percent fructose and glucose, and between 17 to 18 percent water. Maintaining a balance between sugar to water is critical to the quality of honey. Excess water, for example from poor storage, can trigger the spontaneous yeast to ferment, and honey will spoil. The bees nail this balance instinctually, but it is the improper harvesting and storing of honey that can upset the delicate ratio. Over 20 other sugars have been found in honey. There are also proteins in the form of enzymes, amino acids, minerals, trace elements, and waxes. The most important enzyme is sucroase — which is an enzyme added by the bees. This is responsible for converting the sugar sucrose (found in nectar) into the main sugars found in honey; fructose and glucose. It is also instrumental in the ripening of the nectar into honey. With an average pH of 3.9, honey is relatively acidic, but its sweetness hides the acidity. The antibacterial qualities associated with honey come from hydrogen peroxide, which is a by-product of another enzyme (glucose oxidase) introduced by the bees. The plants themselves and soil they grow in contribute the minerals and trace elements found in honey. 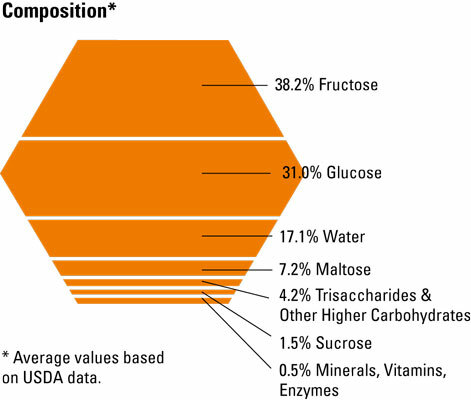 See the figure for a typical breakdown of honey content. Honey owes its delicate aromas and flavors to the various volatile substances (similar to essential oils) that originate from the flower. As heat decomposes the fructose, hydroxymethylfurfural (HMF) naturally found in all honeys increases, thus lowering the quality. Each of these components that make up honey are extremely fragile, and overheating honey or improper storage can compromise not only the healthful benefits but also its flavors.